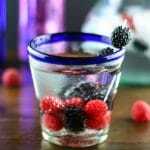 A fresh low-carb, low-sugar drink – this La Croix Berry Vodka Spritzer is the perfect summertime drink! In a cocktail shaker, combine the La Croix Berry sparkling water and raspberry vodka. Shake to combine. Pour into a low ball cocktail glass, garnish with fresh berries, and enjoy. If you prefer a more sweetened drink, add in a few drops of Stevia. If you’re unable to find raspberry vodka, just use regular vodka.